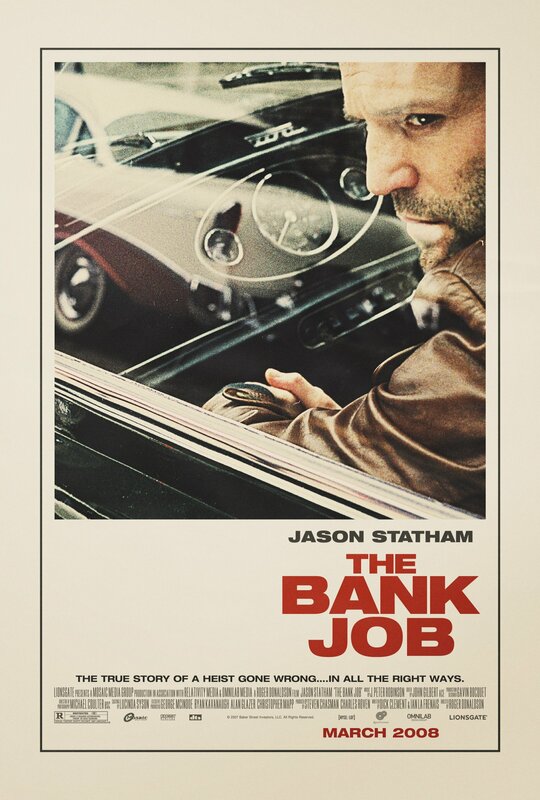 This poster for The Bank Job really goes for an old fashioned 70’s look. But unlike some recent posters, like the ones for Grindhouse, which took some conventions from older posters but added a definitely modern twist, this one really seems to be interested in looking authentic. It even has some discoloring which makes the poster look a bit old and weathered. The most obvious reason for going with this design is to hint at the fact that this is a period movie (the film takes place in 1971) but there are a couple of other interesting reasons. The first is that it should make the poster standout from it’s more contemporary looking counterparts in the theater lobby. Another possible one is that they might have wanted people to be reminded of the great 70’s thrillers and to associate this film with those classics. It kind of worked on me. The poster makes me feel nostalgic and got me to link in my mind the movie with several other films that I really like. But I do have some misgivings about it. The main one is that I think the poster might be too authentic for it’s own good. I can’t imagine it will have quite the same nostalgic effect on younger movie goers who aren’t big film buffs. And even older folks might be a little turned off by the utter antiqueness of it. I wonder if part of my problem isn’t the the film (and the poster) star Jason Statham. I noticed him before I even really registered the look of the poster, and the two things clashed in my mind. I just associate Jason with very modern, very loud thrillers. Even tough the poster won me over after a while there is still a lingering feeling that something isn’t quite right. Anyway, I hope I’m wrong and that the poster does appeal to a broad audience. The movie’s premise (a spectacular bank heist based on a true story, if that wasn’t obvious) certainly is broadly appealing. Maybe a success here could lead to some more compelling earnest recreation of old movie poster styles. I would have liked this poster better had the film been set in modern times. That said, I still think it’s fantastic. Granted, I’ve only seen the new version, but this poster reminds me of the original Thomas Crown Affair. And I like Jason Statham when he isn’t starring in crap. I thinks this retro poster is so cool. It just gives off an old school vibe.
.) Youre so cool! I dont suppose Ive read anything like this before. So nice to find somebody with some original thoughts on this subject. realy thank you for starting this up. this website is something that is needed on the web, someone with a little originality. useful job for bringing something new to the internet!